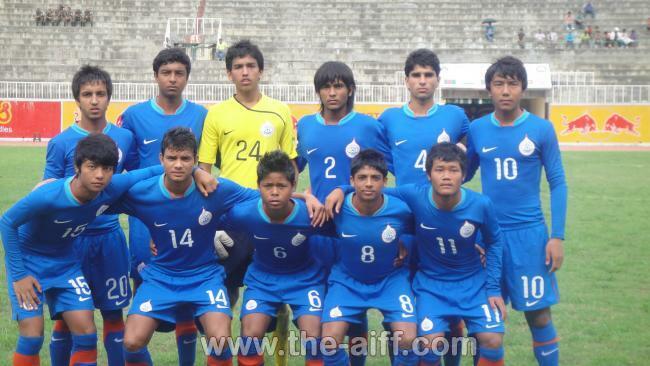 India U-16 team produced a remarkable display of quality football to book their berth for the main qualifying event of 2012 AFC U16 Championship. Team India started their preliminary qualifying campaign on a flying note thrashing Kyrgyzstan by 7-0 margin, before outclassing the mighty Bahrain side 2-1 in their second match. Although, the team was comprehensively ruled over by a marauding Uzbekistan outfit in their third match, the boys responded well to the Tajikistan challenge in a do-or-die game and register an empathetic 4-1 victory, which guaranteed them of a berth in the main qualifying draw of this prestigious tournament. One will struggle to remember a more emphatic start by the national team in any tournament, any age level in recent history. Thomas Josephai??i? ?s boys made short work of Kyrgyzstan with an immaculate display of attacking football. Striker Uttam Rai did justice to the hype surrounding him by bagging an incredible five goals in this match. Uttam started the rout by scoring on the 5th minute at the Transportation Institute Stadium in Tashkent. He doubled his tally two minutes later. Daniel Lalhlimpuia made it 3-0 after 17 minutes as India looked home and dry to make a perfect start to the qualifiers. By the time Uttam completed his hattrick, India was heading into half time with a 5-0 advantage. India didnai??i? ?t stop attacking in second half, despite taking a commanding lead. The boys were aware that goal difference might play a role in the end so they kept on trying to score more goals. Expectedly, Uttam got on the scoresheet again on 55th and 85th minutes as India completed a perfect victory. Bahrain senior team had defeated India 5-2 in Asian Cup, so the boys had a chance to avenge that loss. India started brightly and dominated ball possession. The boys were stunned on 20th minute as Redha Marhoon gave Bahrain the lead, much against the run of play. India tried to get back in the game but was pegged by Bahrainai??i? ?s sturdy defence. The first half ended 1-0 to Bahrain despite India being the better team. India came back roaring in the second half as Dehradun lad Raja Rawat scored on 52nd minute to make it 1-1. Daniel Lalhlimpuia was brought down in the box on 53rd minute as India got a golden chance to take the lead from the spot. Captain Lalramzuava was unlucky as his shot hit the cross-piece before bouncing out. India kept probing for a second goal as Daniel came close to scoring. Eventually, India got another penalty as Lalramzuavaai??i? ?s free-kick hit a Bahrain defenderai??i? ?s hand. This time full-back Myron Mendes stepped up and made no mistakes from the penalty kick. India grew in confidence after taking the lead as Uttam and substitute Muana got good chances to increase the advantage. Sajid pulled out a top drawer tackle to deny a Bahraini striker a one on one chance with Supratim on 84th minute. India hung on to a 2-1 victory in the end. Though this win wasnai??i? ?t as emphatic as the first one, it showed grit and determination of the team. The gulf of class between India and one of the most improved nations under AFC was all too apparent in the third match. India began well in this match with Uttam Rai and Harmanjot coming close to scoring in first 15 minutes. The flood gates opened with Abbasov Shohjahon putting the home team ahead on 18th minute. The rest of the first half was all one way traffic as India went on conceding goal after goal. When the half time whistle went the scoreboard read Uzbekistan 6-0 India. The second half was no different as Thomas Josephai??i? ?s team was subjected to the exact same treatment they meted out to Kyrgyzstan in first match. The home team kept on piling misery on India with three more goals. Final score was a humiliating 9-0 loss. This loss not only gutted the confidence of these young players but also had a damning effect on goal difference. Abbasov Shohjahon finished the match with 4 goals against his name while Odilov Mukhiddin finished with a hattrick (scored in 4 minutes between 26th and 30th minutes). This loss, coupled by a win for Tajikistan against Kyrgyzstan made India’s last match a must-win. Team India was in a tricky situation ahead of their last and final match of the group against Tajikistan. A win in the game could have propelled them in to the main qualifying event; however a loss would have crashed the dreams of millions of Indian fans, while in case the match would have ended in a stale-mate, India’s fate would have been decided by the outcome of Uzbekistan vs Tajikistan game. Clearly, the IndianAi? ?team did not wanted to be in a position where all these permutation and combinations would have come in to effect and went on with an attacking mindset to notch up a victory and book theirAi? ?slot for the main draw. However, the Indian team was stunned by their counterparts as Tajikistan managed to take an early lead in the 16th minute when Komron Tursunov converted from the spot. Conceding the goal woke the Indian youngsters up from slumber and they continued to attack Tajikistan defense with renewed vigor. Tajikistin defense could not sustain the pressure for too long and Lalramzuava blasted the ball past the goal-line from an wonderfully executed direct free-kick. Just on the verge of half time break, the sensational Uttam Rai scored the second goal for India from an inch-perfect assist provided by Daniel. India wentAi? ?for the lemon break with an avtantage of two goals to one in their favor. Around the hour mark, Sarthak Golui doubled India’s lead from a well-taken header off a Raja Rawat free-kick to make it 3-1. Daniel, who has been impressive through-out the whole tournament, then went on to hammer the fourth nail in Tajikistan’s coffin by scoring a graet individual goal in the 90th minute, thus completing a 4-1 drubbing of their central Asian rivals and confirming their participation for the main qualifying drawAi? ?of 2012 AFC U16 Championship. very nice article.. covered so well… 3 cheers for young indian footballers… hope they will show the right path..
@somnath: Indeed a great sign for the future of the Indian Football.Congrats to the boys for doing us all proud.The likes of Uttam Rai,Daniel are great futures of the country.Focussing on the senior team.What are the upcoming matches for the senior team.I have heard that we are to play 3 friendlies this month is this true? ?And what do u make up of the fact that we still don’t have a coach?? Please recheck and correct this,,,, Tajikistan won against Bahrain..? You are correct. The change has been made. The future of Indian football looks promising provided AIFF nurtures this team properly.